Dryer Vent CleaningAnother air duct or chimney that most people forget about is the dryer vent duct. Most people clean out their lint filter and think that is it. However, your dryer vent duct is where the lint can really build up and get clogged. This lint can’t only cause your dryer to use more energy, costing you more money, it is also highly flammable. These are two important reasons why you should have your dryer vent cleaned and inspected when your dryer doesn’t dry within one cycle. Our commitment to home safety and family health will protect you against potential fires and save you money as well. In addition to lint buildup, improper installation of your dryer vent system can also pose a serious danger to you and your family. There were 15,500 dryer vent fires in 2000 according to The Consumer Products Safety Commission. We are determined to lower that statistic by performing a routine service inspection that will detect potential hazards such as the presence of flammable vinyl duct or a duct run that is improperly routed. A standard cleaning involves, usually, cleaning the dryer vent from the outside exit point of the dryer vent. This could be from the side of home, or the ground. Cleaning your dryer vent keeps it free from lint, debris, and/or bird’s nests. We also check all connections to determine if any other services need to be addressed. We service all venting situations including today’s extremely long vent ducts. 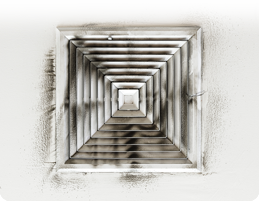 These ducts are especially susceptible to lint buildup.